Streamlining presentations just became a lot easier with AxPyMOL, a plugin for Windows PowerPoint that enables presentation of 3-D molecular data without having to "tab out" of PowerPoint slides. AxPyMOL allows users to easily embed PyMOL shows saved from actual PyMOL sessions directly into PowerPoint slides. 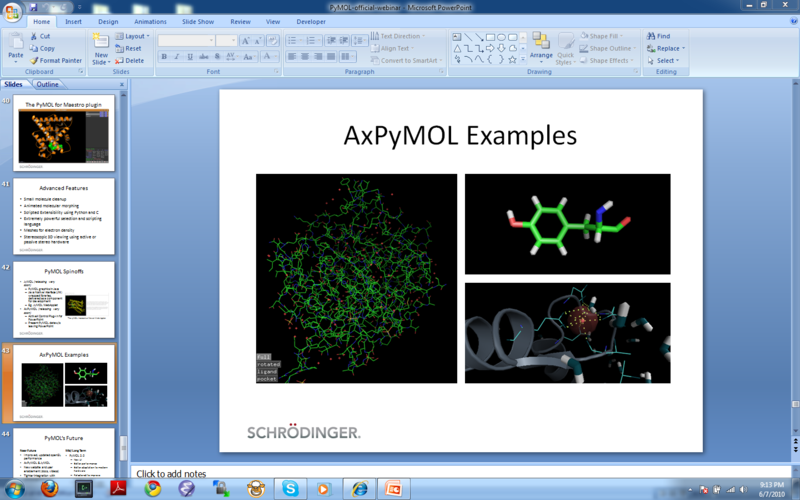 During presentation, the PyMOL shows can be manipulated within PowerPoint to display structures using multiple vantage points and rendering schemes set up in advance. Users can simply advance through the saved scenes of a PyMOL show without ever exiting PowerPoint. Visit purchasing options to obtain a license. Windows 32-bit or 64-bit 7, 8, 10; PowerPoint 2003, 2007, 2010, 2013, and 2016.